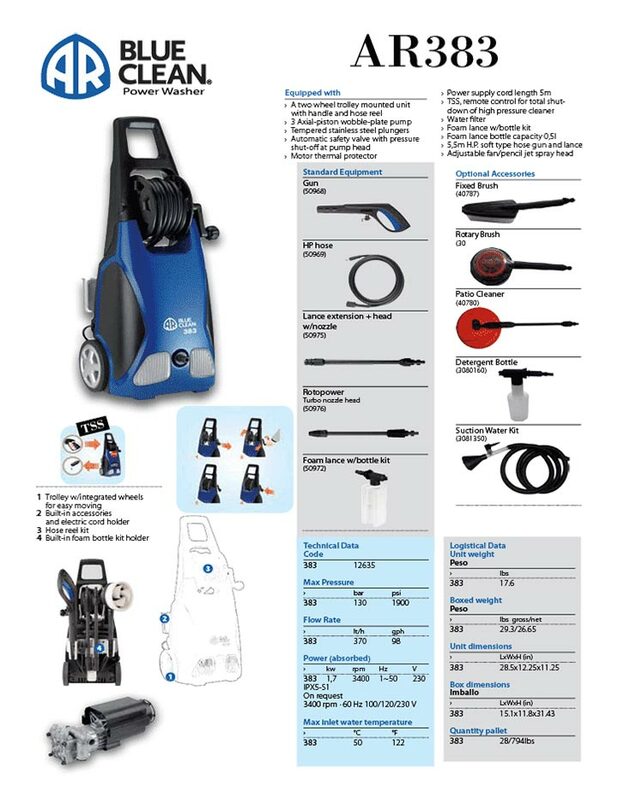 Electric pressure washers like the AR Blue Clean AR383 are capable of producing high velocity water sprays. This is their secret to stripping grime and dirt away while leaving the surface underneath unharmed. When you combine a detergent or chemical solvent with that kind of high pressure spray, there simply isn’t a lot of dirt and grime that this electric pressure washer cannot handle. The first thing that you’ll notice about this AR Blue Clean AR383 is how easy it is to use. The power coming from this machine eliminates the need to apply extra elbow grease to scrub out tough dirt and stains. The pressure washer does the work, so you don’t have to. Because the power source is an electric motor, you can use the AR Blue Clean AR383 in enclosed spaces, even indoors, because there are no worries about fumes. The noise level of the AR Blue Clean AR383 is quiet, and the compact and lightweight design makes it easily portable and easy to store in your garage or tool shed. 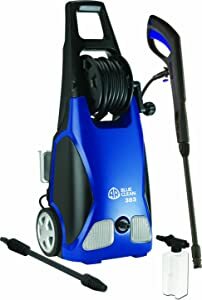 It is a small electric pressure washer that delivers a lot of power. It has a maximum pressure of 1900 PSI and an impressive flow rate of 1.5 GPM. These figures mean you can tackle lots of tough cleaning jobs with minimal effort and in a short amount of time. 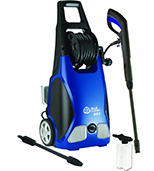 The AR Blue Clean AR383 has an axial-piston wobble plate pump and a powerful 120 volt motor. The included 20-foot hose is made of PVC plastic. It also comes with a 30-foot power cord and a one year warranty. Includes hose wheel with hand crank. You can wind up the hose quickly and easily when you’re done. Cold water option only. Many stains and grim can cleaned with cold water and an appropriate detergent but for some, you really need to have a hot water spray. Hooking the AR Blue Clean AR383 to a hot water source will deliver hot water to your surface to be cleaned, but with a flow rate of 1.5 GPM, any hot water heater will be drained rather quickly. The plastic hose adapter may leak. There is a plastic housing on the hose adapter that connects the spray hose to the AR Blue Clean AR383. This may wind up leaking. This won’t affect the pressure of the spray but it can be a concern. The plastic adapter can be replaced with a brass one but this will be done at the consumer’s expense. The high pressure hose is made of stiff PVC plastic. This material is not as easy to bend as a hose made of rubber may be. Overall, the pros of the AR Blue Clean AR383 outweigh cons of this pressure washer. If you’re looking for an easily handled pressure washer, this model is worth the look.